As so often characters have names, certainly family names, that we never hear in the film. A late review – I’m going back to watching films in my local community-run cinema a few weeks after the showing at the multiplex. There were only twenty of us. True story? Mainly, and enough to count as one. 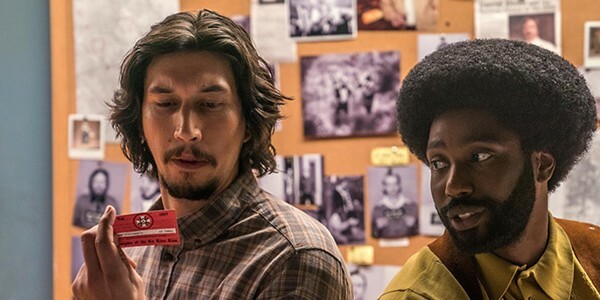 It’s based on the book by Ron Stallworth (played in the film by John David Washington) who was the first black cop in Colorado Springs, and who came up with a plan to infiltrate the Ku Klux Klan, using his own voice for phone contact, and his white fellow cop Flip (Adam Driver) for face-to-face meetings. It’s a film, so the story is enhanced or embellished, but in a positive way. The character of Flip has become Jewish, because the KKK were (are) also fiercely anti-semitic. The drama is enhanced by a bombing – which didn’t happen, though the KKK had been planning to bomb gay bars in Colorado. Some characters are real- Stallwart, Kwame Ture (probably still better known as Stokely Carmichael), KKK Grand Wizard David Duke, others are fictional. 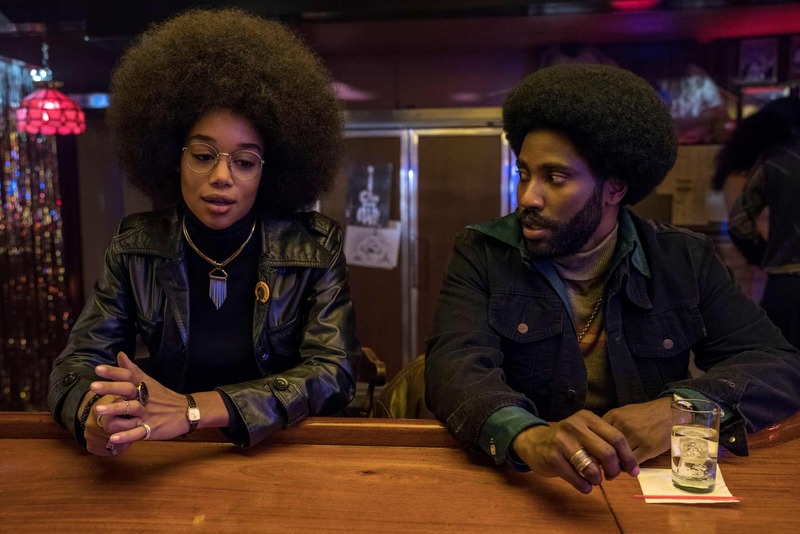 Patrice (Laura Harrier) has the hair and glasses to make her look just like Angela Davis. 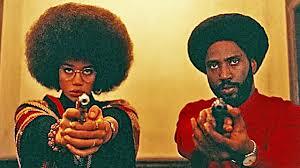 Angela Davis also gets mentioned, and for a while I thought she was supposed to be Angela Davis. The original events took place in 1979, though we had guessed six to seven years earlier, and we were right, as that’s the look that Spike Lee was aiming for. IMDB says that Spike Lee deliberately set it in 1972, so as to reference the “Re-elect Nixon” signs which appear in the background in some scenes. Technically it truly “looks 70s” – the colours, the costumes, the angles, even the cutting, and it was shot on 35 mm film, revealing how over-bright and over-sharp many recent films look. Somehow that gives a feel of reality. The story actually happened in Colorado Springs, so that’s where the film takes place. David Duke flies in from Louisiana. The film may benefit from not demonizing the “Old South” but showing things happening way up in Colorado. Its demographic makes it a surprising location for KKK activity. In the 2010 census the population included 78.8% White, but only 6.3% Black. (Asian were 3%, Latin / Hispanic were 16%, and the overall list of ethnicity adds up to … er … 115%.) I guess some were in two categories. It’s way different from the 25% to 31% Black percentages in the Old South, making it harder to see what the local racists were so exercised about. BUT it does show racism as endemic right across the “red” states (at least). As every epithet for African-Americans ever invented is used in the film, I’ll go with Spike Lee and use “Black” rather than African-American. Listen to Kwame Toure’s black is beautiful speech in the film. 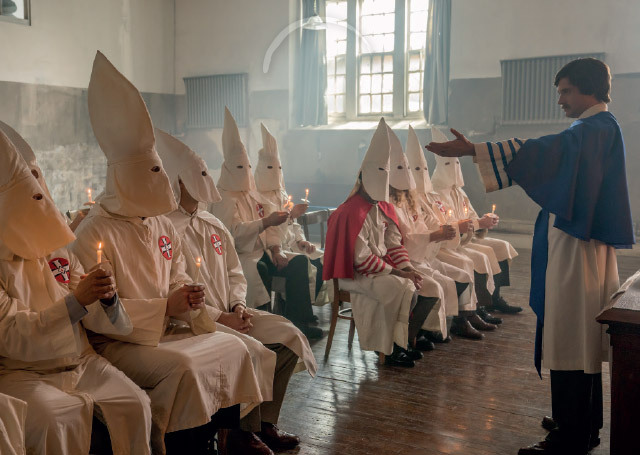 Lee’s film school past comes out in a film that opens with scenes from Gone With The Wind, and intercuts a crucial scene with Klansmen cheering on a showing of D.W. Griffith’s Birth of A Nation. In between, Stallwart discusses how in Tarzan movies he was forced to empathize with white Tarzan against the “savages” and we get to see posters for a few really obscure 70s Blaxploitation movies, before Stallwart discusses with Patrice who was the stronger character, Shaft or Superfly, i.e. Richard Rowntree or Ron O’Neal. It rings bells for me, I had a Shaft v Superfly discussion just last week, though on the music, not the lead roles. (My choice was Curtis Mayfield over Isaac Hayes). There are references to those Black Detective films, none more so than Patrice and Ron in the corridor with guns at the end. Ron is a rookie cop. 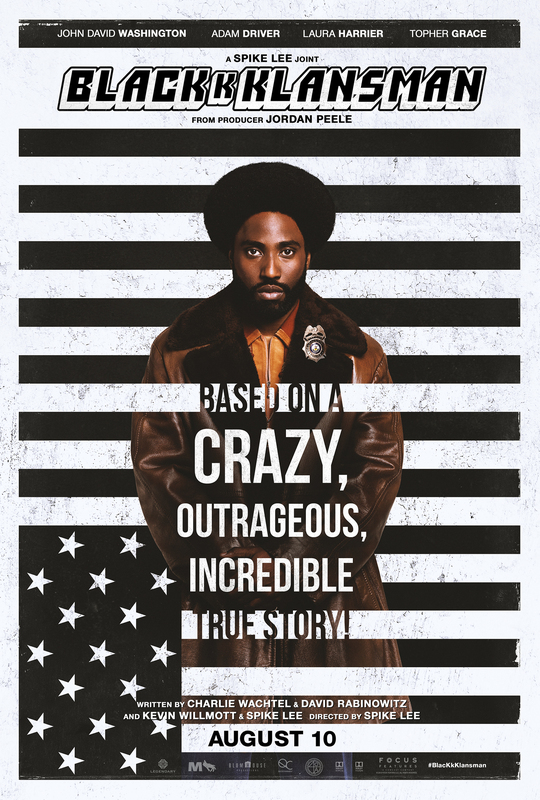 Some reaction to the film is that it makes the police look better than they are, and they note that Ron’s first undercover role was reporting on the Black Power meeting with Kwame Toure, where he meets the beautiful Patrice. It’s later that he switches his attention to the KKK. The film has the evil, abusive white cop Landers (Frederick Weller). Some think there should be more seen who are like him. At the end of the film Patrice is berating Ron … saying she doesn’t sleep with the enemy. Spike Lee has explained that Ron may not represent the average cop, but we should all have a mental “ideal cop” and that’s not a bad thing to aspire too. Adam Driver as Flip Zimmerman with KKK Membership Card. The film is also balanced … lots of bad white guys in the KKK, but also the three cops Ron works with closely are good guys. In the end Adam Driver’s portrayal of Flip Zimmerman is the stand out performance in the film. While Flip was Jewish, he only comes to understand what it means in the face of racism during the film. His family name isn’t heard until near the end either. Nice choice. What most impressed me was the realism and tension (spiced with humour), which was all achieved with a lack of gore and broken body parts and extreme personal violence. Particularly when Flip Zimmerman is under cover pretending to be Ron Stallwart, and Felix (the nastiest one of the KKK group) suspects he’s Jewish, the tension and expectation of imminent violence is palpable, but the visual horror doesn’t come. I applaud that. Perhaps the most memorable thing was Harry Belafonte’s quiet, measured true narration of the gruesome torture and lynching of the mentally-challenged Jesse Washington in Waco, Texas in 1916. It may be one of many that gave Bob Dylan the line They’re selling postcards of the hanging, because that’s what they did, as well as photos and postcards of the detailed emasculation, torture and slow roasting over a fire. Some were printed in tens of thousands. His trial lasted less than an hour. The jury deliberated for four minutes. 16,000 people watched the torture. It’s the Belafonte narration that’s intercut with the 1970s Klansmen getting over-excited over Birth of A Nation. The film was based on the novel The Clansman by Thomas Dixon Jnr. The KKK had originally existed from 1865 to 1871, and died out. So the book and the film created (rather than “revived”) the 20th century KKK. It was their prime recruiting tool, still in use when journalist Jon Ronson watched them in 2002. Many years ago, I used to give a regular Film Studies guest lecture on D.W. Griffith, whom I had studied for my thesis on Hollywood & The Novel. From a film technique point of view he’s unmissable, but even forty years ago, I realized one was best to skip over that earlier film and focus on his next, Intolerance, instead. 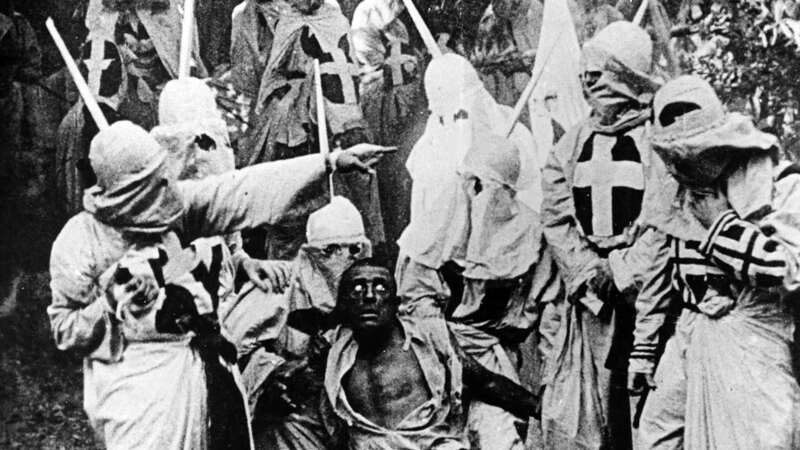 I saw Birth of A Nation several times, but only on viewing this did I realize the full impact of what a foul racist vision Griffith had had (I did know it was deeply offensive racist crap). Note that it was the biggest-grossing film ever at that point, and was released in December 1915, preceded by burning a huge fiery cross to announce its opening. It dominated American screens for the next year, and also note that its release came just five months before the torture of Jesse Washington on 15 May 1916. It was the biggest film in America in that week. That’s why the grisly narration and Birth of A Nation are intercut by Spike Lee. The connection is clear. Lee has “pinned” D.W. Griffith once and for all. He tried once before at film school, with The Answer (1980) and nearly got expelled. The acting performances start with Alec Baldwin as a ranting but inarticulate demagogue over the opening of the film. Corey Hawkins speech as Kwame Toure had everyone feel the extraordinary power of the original person (and he looked handsomely like Marvin Gaye while doing it). Belafonte is the genuine article in Black politics and Civil Rights and remains even at his advanced age totally compelling. The Felix / Connie married relationship is fascinating. They cuddle up in bed discussing racist killings as pillow talk. The contrast with the black actors reinforces that “Black is Beautiful” slogan because these two are not. Ashlie Atkinson gives an outstanding (and ego-less) portrayal of Connie, the would-be bomber. 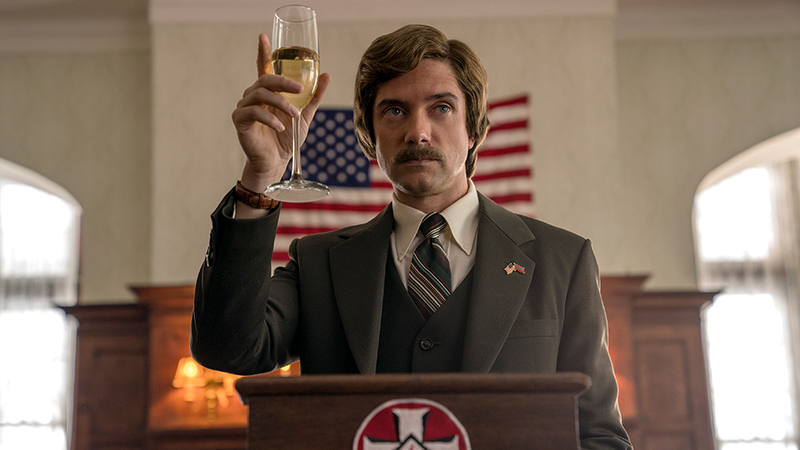 Then there’s Topher Grace, as David Duke, the Grand Wizard of The Knights of the Ku Klux Klan. Duke is trying to institute a policy of wearing suits, calling himself the National Director instead of Grand Wizard in the hope that the slogan America First! will lead him to the White House. No one is under any illusion about the cross references to Donald “Make America Great Again” Trump. You couldn’t be, because while Lee was in post-production in August, 2017, Charlottesville happened. So there’s a coda. He added multi-camera footage of the rally, and the neo-Nazis, and people being beaten in the street and finally the car driven fast into the crowd of liberal protestors. We get to see Donald Trump’s speech where he said there was good and bad on both sides. Much as he might say the same of a march to the gas ovens, because perhaps one of the victims swore at one of the guards. And we get to see the real David Duke in 2017 too. We also realized how edited, or bowdlerized, British TV footage had been. It ends with a dedication to Heather Heyer, killed by that car. Amazingly, no CD around. The streaming option seems limited to the wonderful instrumental score by Terence Blanchard rather than the found songs, which surprisingly included Lucky Man by Emerson, Lake & Palmer, written by local hero (here in Poole) Greg Lake. I want the soundtrack. I don’t stream. I want a physical CD. According to Spotify, there are THIRTY found songs, most of which I have. I’ll have to download Too Late To Turn Back Now by The Cornelius Brothers and Sister Rose, and We Are Gonna Be Okay by Dan Whitener. The end credit has a previously unknown Prince version of Oh, Mary, Don’t You Weep.